New York, New York, so good they had to name it twice. New York City is one of the most famous cities on the planet. It’s home to some of the world’s most well-known landmarks, like the Statue of Liberty, world-class restaurants, and some of the best shops on earth. It’s also been the setting of some of the best television shows in the industry, including Friends and Seinfeld. Whether you want to walk through the hustle and bustle of Times Square or see the scenic sights on offer in Central Park, New York has something for everyone. An array of high-end stores and quality boutiques line the streets of Manhattan, making it a shoppers’ paradise. Chanel, Louis Vuitton and a host of other designer names can be found in New York City. Those who appreciate architecture will also be right at home in the city. New York is home to a wide variety of stunning architectural sights, such as the Dakota Building, the Empire State Building, and the Chrysler Building. You can take in the sights, all while enjoying some of New York’s famous street food. After witnessing New York’s impressive architecture, tourists will find plenty more to do in the city that never sleeps – it’s home to some of the most fascinating attractions in the world, including the Metropolitan Museum of Art, Madison Square Garden and the New York Public Library. Once they’ve finally finished taking in all the sights, shops and other attractions that New York has to offer, tourists can take advantage of the many, many restaurants and other eateries that line the streets of the city. The city’s restaurants serve cuisines from around the world, including Mexican, Italian and Indian. If you’re not in the mood for eating in a restaurant, then grab a bite to eat in one of New York’s pizzerias, bakeries, delis or cafés. If you want to get away from the busy crowds of the city streets, take a stroll around Central Park. One of the most famous parks in the world, Central Park offers lush landscapes, children’s playgrounds and a number of other attractions. Take a trip to the six-acre Conservatory Garden, or simply enjoy the picturesque scenery that the park has to offer. 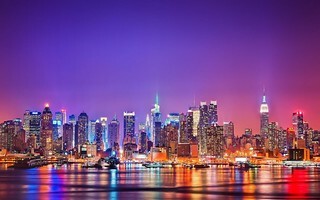 Let Newmarket Holidays handle your trip to New York City. Travel specialists, Newmarket Holidays offer a number of holidays that visit New York and the rest of America’s east coast.